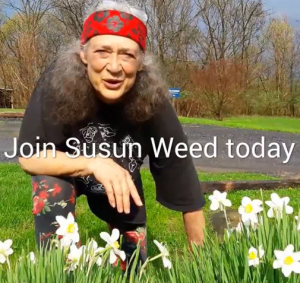 Susun answers 90 minutes of herbal health questions followed by a 30 minute interview with Birthing a New World Kathleen Hanagan. .
Susun talks about ginseng and how the adaptogen term was coined. Adaptogens are important for cancer treatment. Susun interviews Ebony Janice Moore. Ebony Janice is a womanist scholar and activist doing community-organizing work, most specifically around black women's body ownership as a justice issue, and equal access to education and pay for women of color in the U.S. and in several African countries. Her work as an activist focuses on decolonizing everything (specifically authority, education, and mindfulness) and discussing the ethics of excluding hip-hop from a conversation about what is sacred and cite-worthy. EbonyJanice has a B.A. in Cultural Anthropology and Political Science, and a Master of Arts in Social Change with a concentration in Spiritual Leadership, Womanist Theology, and Racial Justice. • vertigo- inner ear, losing balance- slippery elm..
• any plant that reduces blood sugar or blood pressure is not an adaptogen, adaptogens are regulators..
• traumatic birth story- physicalize your anger..
Susun answers 90 minutes of herbal health questions followed by a 30 minute interview with Black Feminist/Womanist EbonyJanice Moore. .
Teleseminar. Monday, 2/18/19, at 9:00pm Eastern. Comfort Touch, A Special Way to Connect with Mary Kathleen Rose & Susun Weed. Comfort Touch® is a nurturing form of acupressure that can bring the benefits of touch to a broad range of people. While it is safe and appropriate for infants, the elderly, and the ill, it can also be enjoyed by anyone seeking relief from the stresses of daily life. Based on six guiding principles, Comfort Touch® offers a safe, respectful, and nurturing approach to touch. It is calming to the nervous system, so it promotes deep relaxation and relief from pain. While Comfort Touch® is a complementary therapy offered in medical settings, is can be safely practiced at home with family and friends. It provides an enjoyable way for members of a family to care for each other, as part of a general focus on health and wellness. Mary Kathleen Rose is a licensed massage therapist, internationally known for the development of Comfort Touch®, a complementary therapy widely used in hospices and other medical settings. She believes that the nurturing, comforting power of touch really begins and ends in the home, and she loves to share powerful, yet simple techniques to be used within the family. A wellness educator and lifelong herbalist, she holds a certification from Susun S. Weed in the "Spirit & Practice of the Wise Woman Tradition." She is the author of several books and numerous published articles, including Comfort Touch® of the Hands & Feet: A Guide for Family Caregivers, and The Children's Tarot: The Road is a River. She is passionate about the relationship between healing and creativity, and loves to play a variety of musical instruments, including piano, drums, and flutes. Kris is the visionary founder of the Women of Wisdom Conference, which is having its 27th Annual WOW Conference, Feb 15 17, 2019. Kris began her life purpose in 1990 when she declared her mission to bring people together. In 1993 after reading The Feminine Face of God, that mission was revealed to her in a vision to create a conference to bring women leaders to Seattle, which quickly evolved into creating a community for women. In 1998 she founded the non-profit organization, Women of Wisdom Foundation, and has followed her passion to empower women to find their voices and share their stories and gifts with each other and the world. Connected with women leaders such as Jean Houston, Barbara Marx Hubbard, Jean Shinoda Bolen, and Marion Woodman, Kris brings important messages to women around the world. Jean Houston gave a tribute honoring Kris's work at Women of Wisdom, stating "Kris has impacted thousands of women", and through the ripple effect, as every women influences each other through their healing journeys, many more woman are making a difference in the world. • 35 years of Shamanic Herbal Apprentices..
• histamine response- anaphylactic shock and osha root tincture..
• as parents we can offer acceptance of our bodies..
• like most of us, you are hoping for a little more control than there is..
• anxious high strung personality..
• types of headaches and herbs for each..
• comfrey nourishing herbal infusions.. Follow Susun's adventures in Paris. In the gardens of the Natural history museum. She shows us Ma huang, which great to open up the bronchial tract. Our first Teleseminar of 2019, next week, Monday, 2/18/19, at 9:00pm Eastern. Susun answers 90 minutes of herbal health questions followed by a 30 minute interview with 'Women of Wisdom Conference' Kris Steinnes .